We took an early morning river trip on Monday (the end of a week of fine very hot days) on a misson to photograph one of the night blooming Mangroves before the flowers fell apart in the morning sun. Even on our return at nearly 8am there was still some mist hanging in the hills and as you can see from the reflections in the water there wasn’t a breath of wind. Last night we had 53mm in some quite heavy showers which excited the frogs. The calls of Litoria gracilenta become a deafening chorus which rises and falls in intensity so that you can almost imagine you are listening to the inner workings of some lungs. Its still raining this morning so perhaps Mick has fine weather now at Sandy Straits! And so to the main reason (or was it an excuse?) for this river trip. The Gulngai-hybrid Apple Mangrove (Sonneratia x gulngai), one of the rarest trees in the tidal estuaries of the Daintree coast, that was first identified by Dr Norm Duke (University of Qld) in 1984. It is a naturally occuring hybrid of S. alba and S. caseolaris displaying hybrid vigour so that it grows faster and taller than its parents and has larger leaves and flower buds. The fascinating part of the story is that the parent trees are separated by location with the white flowering Apple Mangroves residing at the downstream end of the estuary while the Red-flowered Apple Mangroves occur in the upper, less salty section of the estuary. And to add further to the challenge of creating the hybrid the flowering periods of the parents may only overlap occasionally giving a low potential for the production of hybrid seed. We travelled down river without stopping in the hope that we were early enough to capture some entire flowers. On the side of the tree facing the sun the flowers were already beginning to collapse, stamens dropping into the water as we focused the camera! 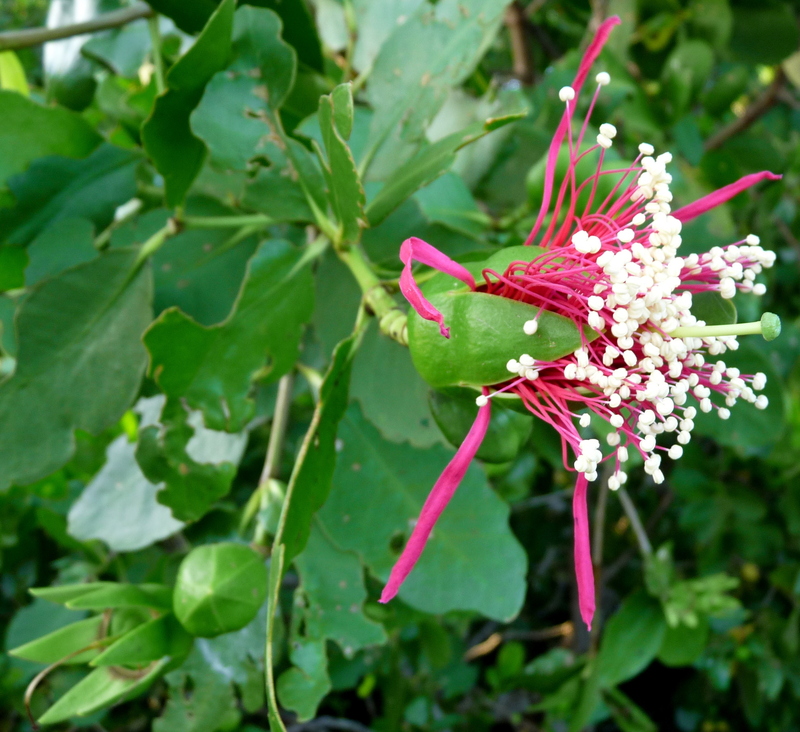 However on the shady side we found this stunning flower still with its ribbon-like petals. There is no mass flowering, this hybrid flowers twice a year (trying to match flowering periods of both parents)with small numbers of blooms produced over several months. The last photo was taken soon after leaving the mouth of Barratt Creek – it shows Thornton Peak, known as Wundu by the Kuku Yalanji, in a very soft hue. At 1374 metres it is a much revered local landmark – when returning home after a trip to Cairns I always look for my first view of Thornton. 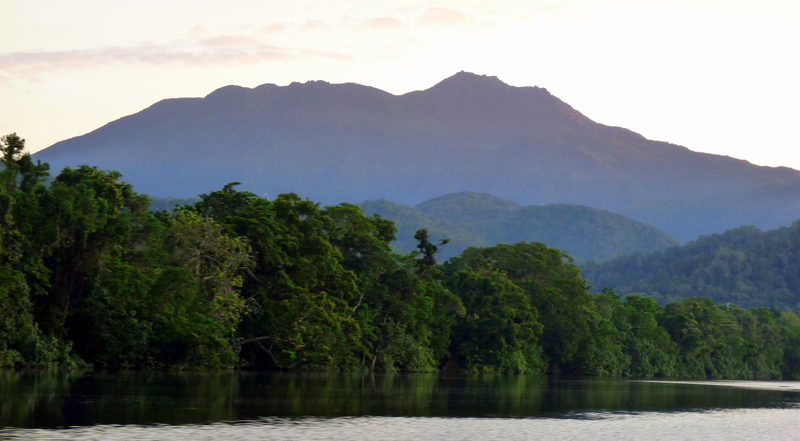 Our thanks to Dawn of Daintree River Experience for generously lending us the boat. 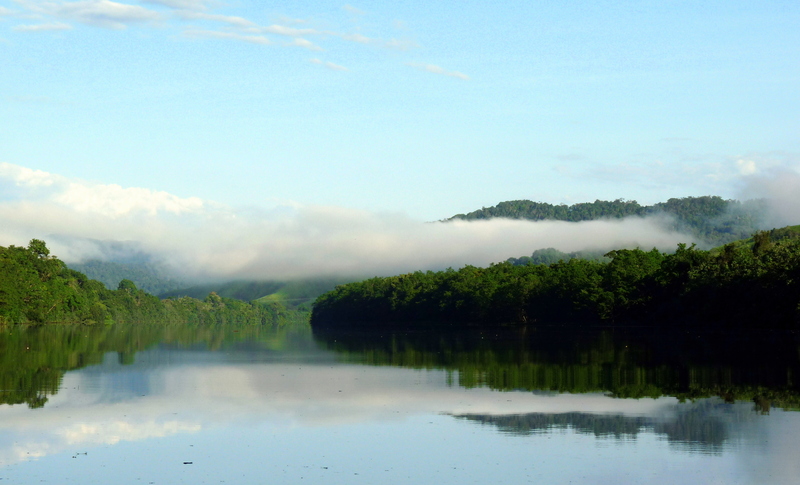 It is a very comfortable craft for enjoying the delights of the Daintree river – an open boat allows better views of the birds and plants but Explorer 11 also has a canopy that can easily be pulled up in the event of wet weather. This entry was posted in Daintree Plants and tagged Daintree River, Mangroves. Bookmark the permalink. That scenery is magnificent – and what a fascinating mangrove tree. The flowers are beautiful and certainly worth an early morning start to see them. You are right! The last two days down here have been dry and sunny but it is going to take a while for everything to dry out properly – and the BOM is predicting a return to showers tomorrow. Thanks for your comments Mick – it is lovely to be out on the river early in the morning. Although it is a reasonably quiet boat it wouldn’t compare to the peace you would experience in your kayak. Unfortunately paddling any canoe/kayak shaped craft on the Daintree River is out of the question as the risk of crocodile attack is too great. Ain’t nature a marvel. And all amid some sunshine. Rain returned here late yesterday. Sure is Tony. It looks like we have a bit more ‘weather’ coming down the coast, just have to hope there’s some gaps between the showers! Magnificent scenery (as Mick has already said) – but its worth restating. Interesting Mangrove biology going on there. By the way your previous posts on the “Big Chook” are very interesting. “Build it and they will come” – a theme from an American baseball movie “Field of Dreams” is appropriate for your Cassowary feeding area. Thank you for your kind comments Denis – we are very lucky to live here and its fun to share some of the special times we enjoy.